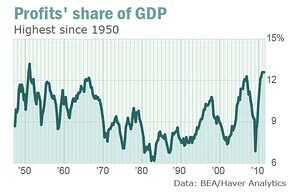 Profits account for a larger share of GDP than at any time in the past 60 years. Rather than dwell on today’s profoundly and disturbingly dismal GDP numbers (1.3% growth in Q2, less in Q1) or the theater of the absurd occurring on Capitol Hill, let’s carefully note that corporate profits are at record levels even as the economy gasps for air. Corporate profits now account for the largest share of GDP – 12.6% – since ’50 while wages and salaries account for the smallest share – 54.9% – since ‘55.